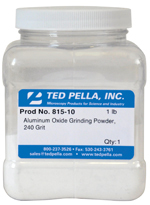 Aluminum oxide grinding powders for fine grinding or rough polishing of petrographic specimens, soft metals and their alloys, and cross-sections of electronic devices. Softer than diamond or silicon carbide. Normally used in a slurry. In terms of hardness, Boron carbide (B4C) with a Mohs hardness of 9.5 is third only to diamond and so makes an excellent lower cost alternative to diamond for the precision grinding, lapping and polishing of most hard materials. 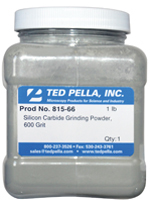 Silicon carbide grinding powders for fine grinding or rough polishing of semiconductors, ceramics and ferrous materials. Softer than diamond but harder than aluminum oxide. Normally used as a slurry. Graded by particle size in microns, 5lb container size.